indianapolis – Farmers are renowned for their work ethic and what they grow. Whether it be tending to a farm hundreds of acres wide, or managing a small family farm for decades, farmers have the reputation of waking up early day-after-day to do the hard work only so many can accomplish. But farmers are not simply born, they are grown. And Exeter’s Future Farmers of America program is sprouting into one of the best crop of students the city has seen. The Exeter FFA had a lot to cheer about as their delegation to the 89th National FFA Convention returned home from Indianapolis after the October 18-22 trip. The award was part of the largest and most successful trip to the FFA National Convention in the Chapter’s 75 plus year history. Twelve Exeter members and three advisors attended the event. The National Chapter Award program recognizes FFA chapters that successfully complete an annual Program of Activities (POA), which includes a series of activities designed to encourage its members to grow as individuals, to work as part of a team and to serve others. The chapter was selected as a finalist for the Model of Innovation award in Community Development. Exeter FFA members Elijah Ewing and Isabella Gomez presented and interviewed on behalf of the chapter. Exeter FFA was recognized as the National Winner on stage in the Bankers Life Fieldhouse in front of a crowd of over 61,000 members and guests. Chapter President Kaitlyn McFarlan traveled with the state delegation and represented California as a voting delegate at the conference. The chapter had two Agriscience fair teams competing as well. 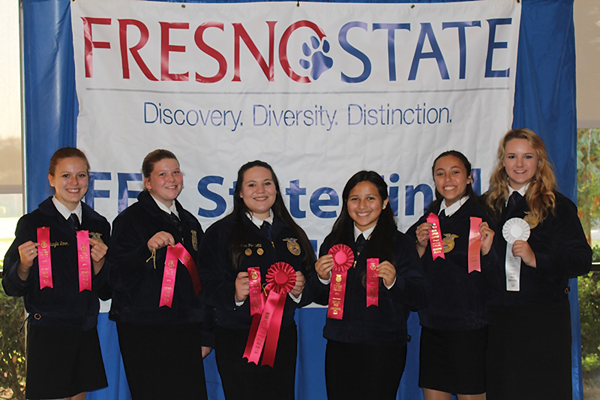 These two groups won their respective division at the State FFA Science Fair in April, and earned the right to submit their research papers to the National level. Only 15 projects in each division are selected from the nation each year. As a National Finalist, students earned the right to give their poster presentation at the National Convention. Kaitlyn McFarlan and Francesca Perrotta earned 5th place in the Animal Systems team division and earned a Gold award. Kaylee Rumbaugh and Elijah Ewing earned a Silver ranking in the Plant Systems team division. There were also three Exeter FFA members who were honored with the American FFA Degree. This is the highest degree awarded to any FFA member and less that one half of one percent of the total membership will reach this pinnacle. All recipients of this degree are out of high school, in accordance with the requirements of the degree. The Exeter recipients this year are Sarah Dreyer, studying at Cal Poly San Luis Obispo; Breanne Sturges, Sol Ross University in Texas and Connor Crookham, Montana State University. Both Ms. Dreyer and Mr. Crookham attended the conference to receive their degrees. Other members who attended the convention were Taelor Hire, Lucy Villegas and Austin Robbins. All of the students in attendance are eager to bring the excitement of the National Convention back to their classmates at Exeter.